In this SoapUI Pro tutorial, we are going to see Data Driven Testing using SoapUI Pro. Performing load testing and performance testing with huge data are often time-to consume. This can be overcome through Data driven testing in SoapUI Pro. While running data driven scripts, it will fetch the data from external data source file and then put into the corresponding variables present in the scripts. For example, let us take login form. This form usually contains the user name and password fields. During functionality testing of the login screen, we need to prepare the test data with different combinations of the username and password and there should be variables to obtain the data in the script correspondingly. When we call the web service from SoapUI data source test step, it will read first set username and password. And then it will assign the values to the corresponding variables in the script. After that, the web service will start the process internally with the username and password. Take a look at the flow diagram of common data driven testing. This can be implemented via SoapUI pro. Keyword driven testing is a software testing type applicable for both manual and automated testing (most commonly used). It is also called table driven testing. Even though this is quite simple, it does need more time to collect keywords and appropriate functionalities. The “Control File” contains test scenarios to be executed/automated. When testing from the initial stage, the user has to select the particular test scenario from the data file. This will be determined based on the flag ( Yes / No ) present in the data file or excel file. “Test Cases File” component contains the detailed steps of flow to be executed and this will be prepared in the form excel containing keywords, objects, parameter and checkpoint columns. Next component is “Startup Script”. This is the first executable script which instantiates the objects and reads the data from the content file. After that, it will start executing the test scenarios that are marked as Yes in the control file. The driver script is responsible for reading test case file and validates the keywords. Then it will call the respective utility script functions based on the keywords available in the test case file. Apart from this, we need to handle the runtime errors in the driver script itself. It consists of relevant logical methods/functions based on the keywords. These scripts will be generic and can be utilized across the applications. We will use CurrencyConvertor web service to practice. Before creating the new project in SoapUI Pro, prepare test data based on the input request for the web service as shown in the below screenshot. Once test data is ready, open SoapUI Pro and follow these steps. 3) SoapUI displays Configuration screen with the File, Worksheet, Start at Cell and Ignore Empty options. 4) File option should be filled with the valid file name selected from a local computer. Next enter the exact worksheet name in the Worksheet text field. 5) Following that, “Start At Cell” text field has default cell value as “A1”. Change if needed. 6) The “Ignore Empty” option helps us to avoid processing blank cells from the selected cell range. If it is checked, SoapUI will not consider the blank cells from the worksheet. 8) Enter the worksheet name as present in the original excel file. Let us specify “Sheet1” as we have entered the test data in the Sheet1. 9) Leave the default Cell name and check the checkbox. Next, we need to add Property names according to the excel headers name. Add property name icon will be present in the toolbar with the (+) symbol. 10) When all the required property names are added, we can execute the data source. 12) Now SoapUI Pro will prompt us to specify the number of rows to be fetched from the excel file. If we need all the rows means, we can specify as zero. See the below screenshot for your reference. 13) Finally, click OK to populate the data present in the bottom of the section. 14) To iterate row by row during execution of the test suite, add a data source loop under the test suite where the data source test step is added. Now it is time to execute the test suite by passing various input data. Double click on the test suite name and then click Run icon. After the execution of the test suite, SoapUI Pro will show us the test results. This is a really useful feature to maximize the amount of testing with faster and in an enhanced fashion. However, it is sensitive to changes made to the UI during future releases. It is easy to recover by making appropriate changes to the data tables. The next SoapUI tutorial is the last one in the series and will talk about exporting requests and responses to external files. Thank you for sharing these tutorials. can ddt done in free version of soapui or its part of pro version only? where can we see all inputs and output records ??? Is it possible to connect to a database with JDBC connection? Also with Soap UI is it possible to test Db tables using sql query count functionality? All I wanted is to retrieve the count of records for evert table.So it is possible to have those queries set in soapUI Pro and running them would retrieve all results at one go? 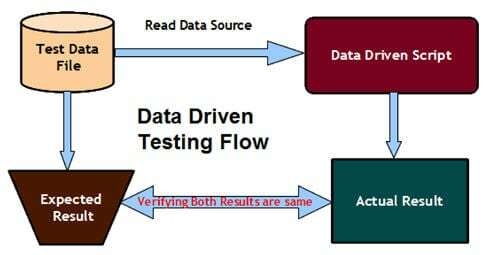 Can any one share the code of Data Driven Framework in TestNG (Without data Provider) it should have file input or output functionality. Hi, good tutorial, is it possible to use the response values to send a new request? If anyone knows how to do it please share the answer. Thanks.